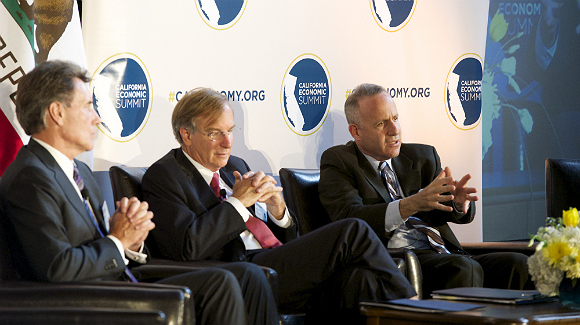 Three big themes emerged from Tuesday’s California Economic Summit Capitol Day, where more than 250 civic leaders representing the state’s diverse regional economies met with lawmakers and state officials to discuss how to build on the success of the Summit’s statewide prosperity strategy. This action plan, shaped by participants in last November’s Summit, outlines how regional and state leaders can work together to support the training of California workers for the 21st-century economy, make the promise of sustainable, affordable communities a reality, and champion long-term investments in the state’s transportation infrastructure, water systems, and unparalleled working landscapes. Even so, over the last two years the Summit’s unique partnership between California Forward and the California Stewardship Network has steadily advanced these priorities. “But never more so than this year,” as Summit Steering Committee co-chairs Paul Granillo of the Inland Empire Economic Partnership and Eloy Oakley of Long Beach City College put it in a letter to attendees. While the state is beginning to turn more and more to regions to develop the strategies that will achieve state goals, Capitol Day’s focus was on what’s next: How can the Summit build on its work thus far—and continue to expand the unique platform it provides for civic, regional, and state leaders to set priorities, encourage innovation, and learn from each other? 1. Training workers for the new economy: Jobs may be roaring back in some California cities, but the recovery isn’t just uneven, it’s also not enough—not yet. Poverty rates have doubled over the last two decades in regions like the Inland Empire, where less than one in five residents have a college degree. Meanwhile, even fast-growing regions can’t always find the workers they need: The state is projected to face a shortfall of 2 million skilled workers in the next decade, especially in the expanding high-tech manufacturing sector. “Workforce development is going to be critical,” said Kish Rajan, executive director of the Governor’s Office of Business and Economic Development (GO-Biz), who spoke on a panel of regional workforce training experts and private sector manufacturers. Rajan noted the state needs not just to support career technical education programs—an area state leaders, with the Summit’s support, have made strides in this year—but to build partnerships between schools, workforce training programs, and industry. 2. Making the promise of SB 375 a reality: With California’s population projected to swell to 50 million in the next three decades, it’s clear that cities must find new ways to grow. A 2008 law, SB 375, has fundamentally changed the way communities are thinking about “sustainable” regional growth—requiring regions to develop plans that tie together transportation, land-use, and housing for the first time. But paying for these projects—from transit stations to water systems and affordable housing—continues to pose problems, as does navigating the regulatory tangle of the state’s complex environmental laws. Sustainable funding: While the state will use a portion of future cap-and-trade revenues for sustainable community development, there is still a need for more local infrastructure financing tools—including the tax-increment financing authority once available to redevelopment agencies. The Summit is supporting the enactment of one such tool before the legislative session ends, urging lawmakers to provide cities and local jurisdictions with a new Enhanced Infrastructure Financing Districts authority. A new long-term funding source for transportation will also be needed to replace the gas tax, a revenue stream that is failing to keep pace with rising infrastructure demands. 3. Ensuring California’s water sustainability: While much of the attention in Sacramento this summer has focused on the debate over whether to put a $7 billion water bond on the November ballot, the fact is, even that won’t be nearly enough to solve the state’s perennial water challenges. Californians spend about $30 billion each year on water, most of it at the regional and local level. And it is that model—water users paying fees to support local infrastructure—where many experts believe the state’s long-term financing solution may lie. This, he noted, will have to be paired with efforts to integrate California’s highly decentralized water governance structure, as well—a point Summit partners including California Forward and the Water Fix Coalition have also recently made. “One of the fundamental problems we have in water management is the enormous fragmentation; we have literally thousands of local, regional, state, and federal governments that engage in some form of management or regulation,” said Snow. For California to prosper, similarly difficult decisions lie ahead on a whole host of issues, from workforce and transportation to sustainable communities. In the year to come, the Summit will be working to help its expanding network of regional and state leaders make these hard choices—together.